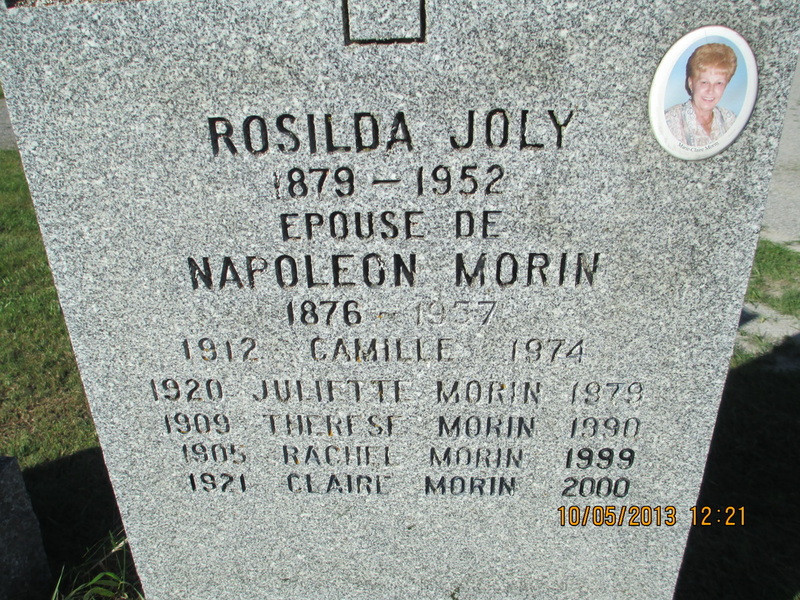 Many of the headstones in the coming chaptes have not been identified as a direct family link. However, most likely all are distant relatives. 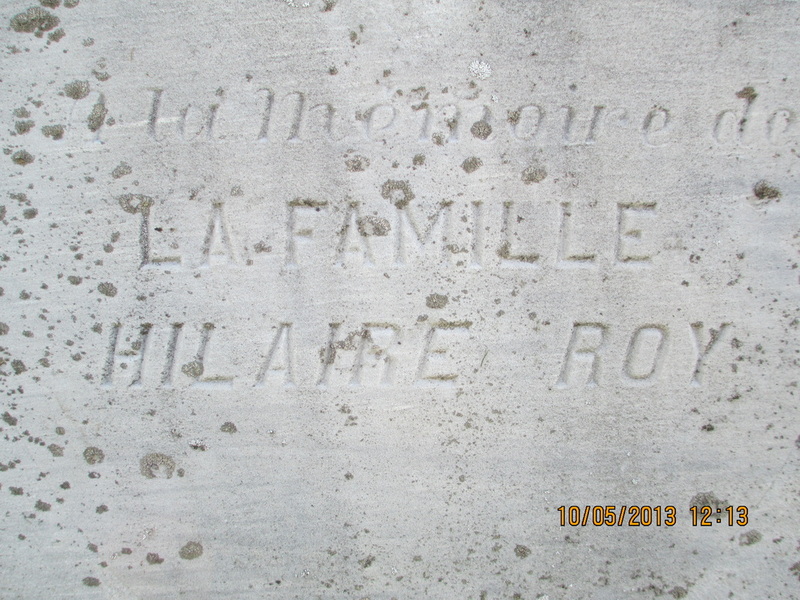 This headstone is in memory of Vitaline Blaise (1899-1961) spouse of Theophile Roy (1873-1941) and Marguerite Roy spouse of Samuel Kearney (1906 - 1981). 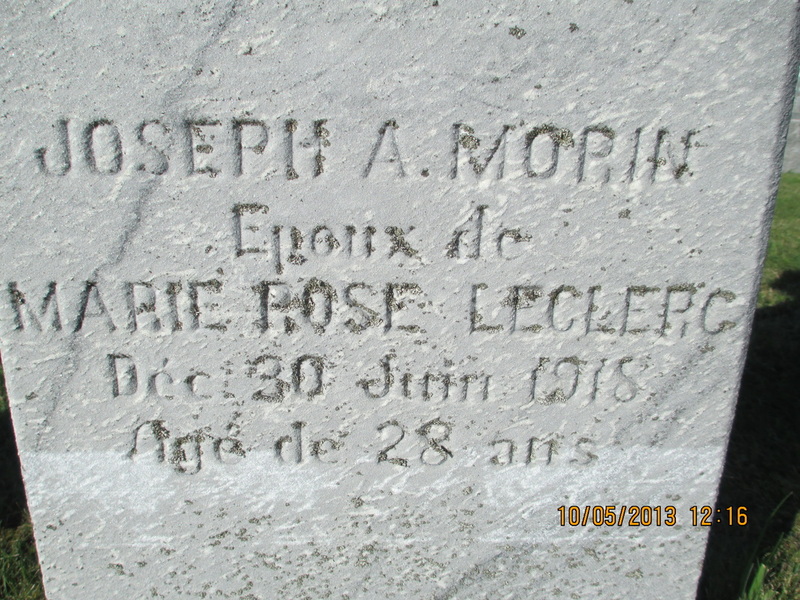 Photo taken in an unidentified Montreal Cemetery. Photo courtesy of Pauletta Brin Niernberger. Not only around the airport but nearly everywhere we went construction was detouring or slowing down traffic. The speed and distance is measured in kilometers. Easy tip to remember: multiple by 6. Speed limit maximum of 70 K. in construction zone is @ 42 miles per hour. Leaving Montreal we head southeast across the Champlain River / St. Lawrence River to La Prairie. At the beginning of my journey these sights of modern living were a disappointment and a reality check that time does not stand still. Gone are the quaint villages of centuries ago in my romantic imagination. 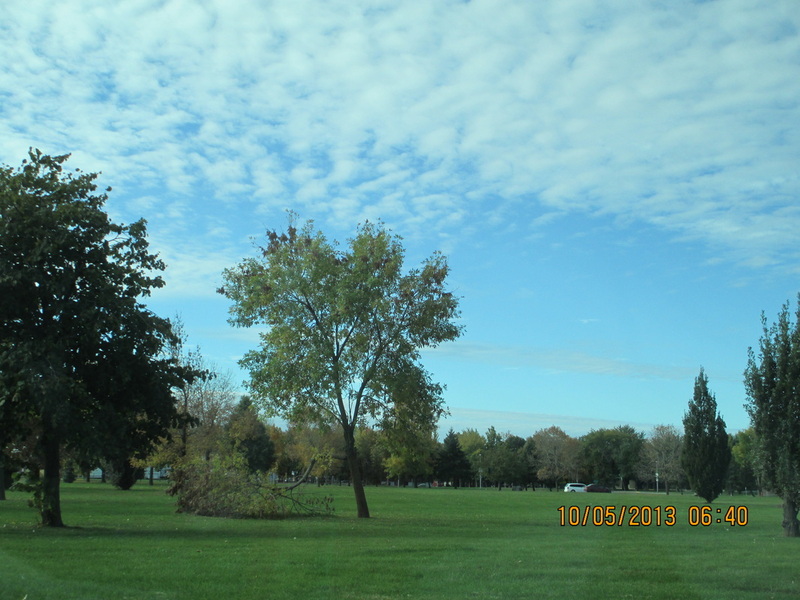 Instead, manicured parks in towns close to metropolitan cities such as Montreal and Quebec City, as well as well-kept rural homes and yards showing pride of ownership. 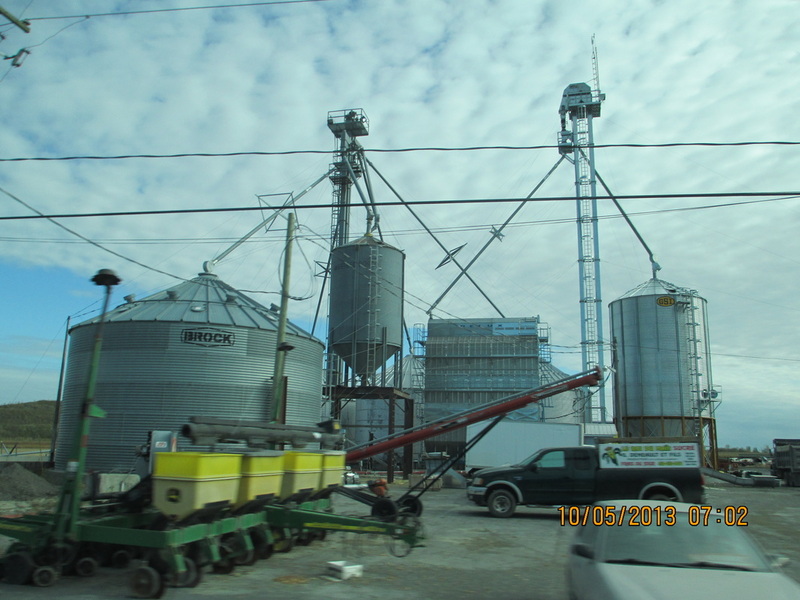 Profitable farming operations nearly each with one silo in the countryside, In many cases numerous silos and bins that appear to be commercial operations. The area appears lush and crops abundant. I wonder why our ancestors left this area for the United States during the Homestead Act of 1862 and then remembered there were a series of droughts, and killing winters, that drove farmers to head south to Illinois and west to Kansas. But before that an eariler history is to be told. We couldn't go far without seeing the St. Lawrence - the life-blood of farmers and fisherman. Near every Catholic church had if not one, but several silver steeples. This steeple shown goes with the church to the right. 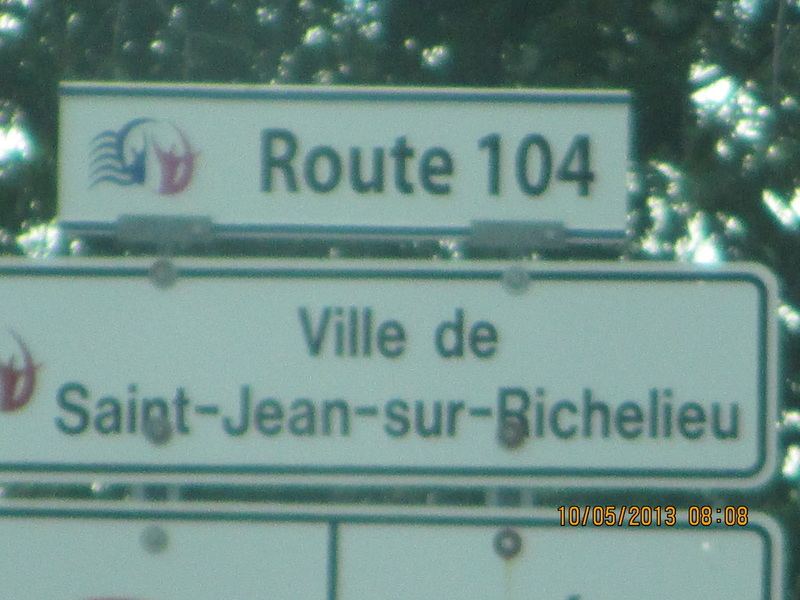 We drive to St. Jean sur Richelieu not knowing what to find. 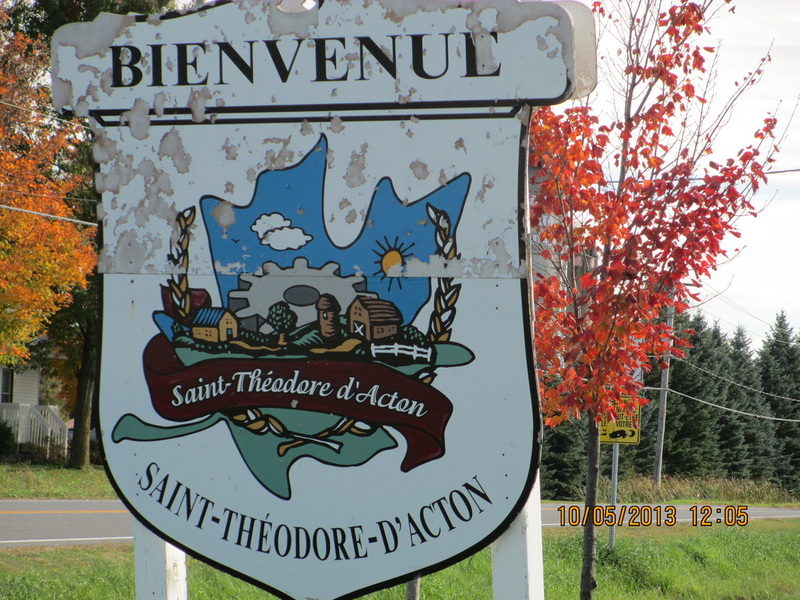 Our AAA Canadian-approved map did not list the small villages I was seeking. 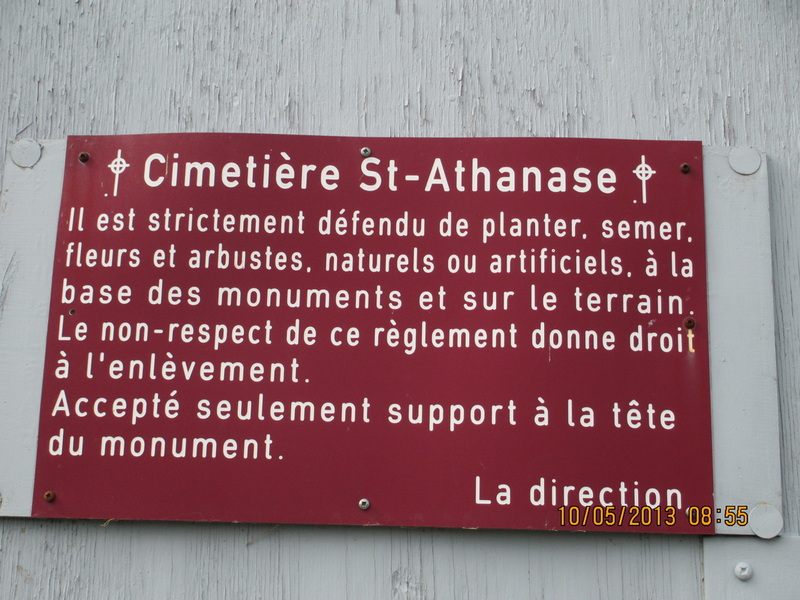 I learn that in 2000 the surrounding villages of Saint-Luc, St-Athanase, Iberville, and Acadie merged into the city of St-Jean-sur-Richelieu.There are many cemeteries tucked away in the area: St-Alexandre, Mont-Saint-Gregoire, St-Athanase, St-Sebastien, Marieville, Ste-Angele-de-Monnoir, Ste-Brigide. 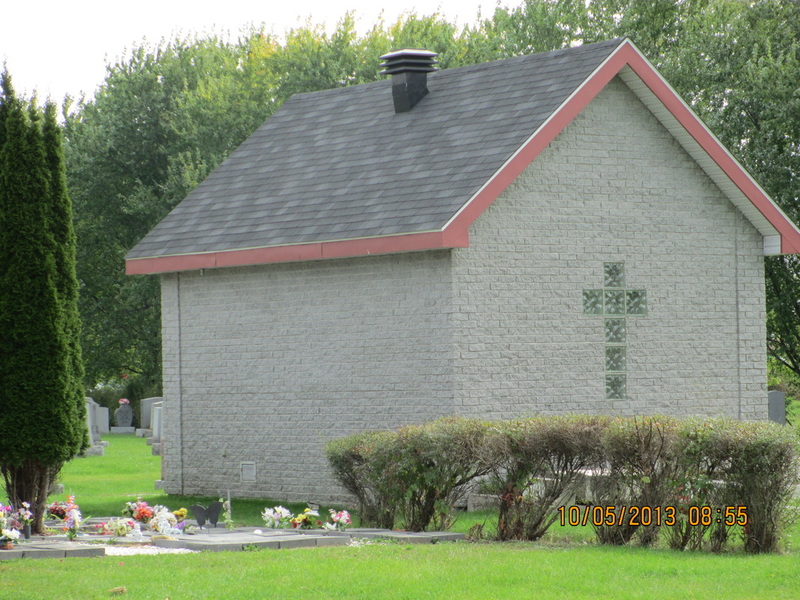 St-Jean-sur-Richelieu. We were lucky to have stumbled upon a few without the aid of a detailed map. 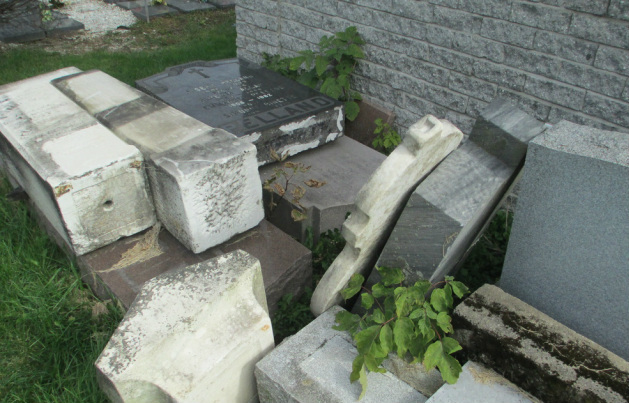 At the Cemetery of St. Athanase many old headstones have fallen and collected in a pile perhaps until someone figures out what to do with them and/or funds become available for repositioning. A sign on the structure to the right identifying this as St. Athanase Cemetery. This fairly recent structure was locked. A chapel, or perhaps used for storage. 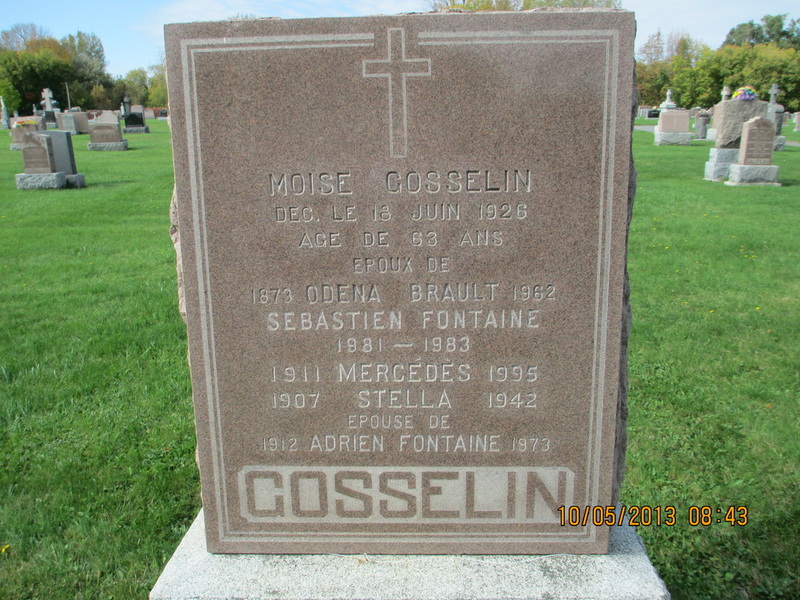 Throughout my journey I would find many familiar French names, although not of my family lineage such as Moise Gosselin d. 1926. Spouse - Odena Brault d. 1962. 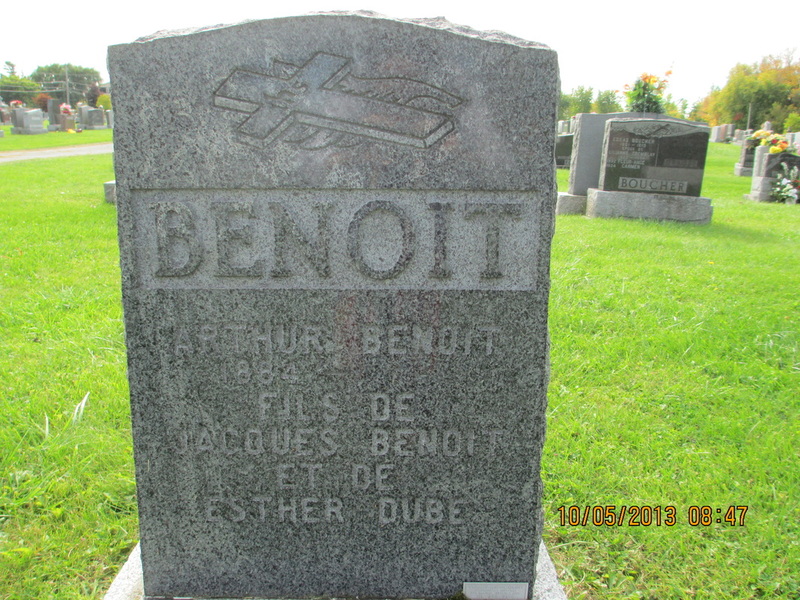 Throughout my journey I found many Benoit headstone in many cemeteries. 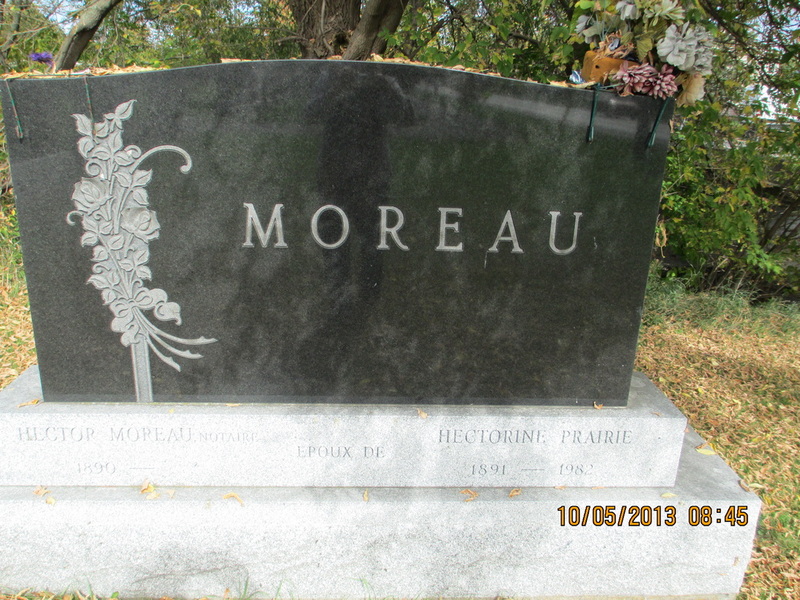 There is a Moreau in my lineage. 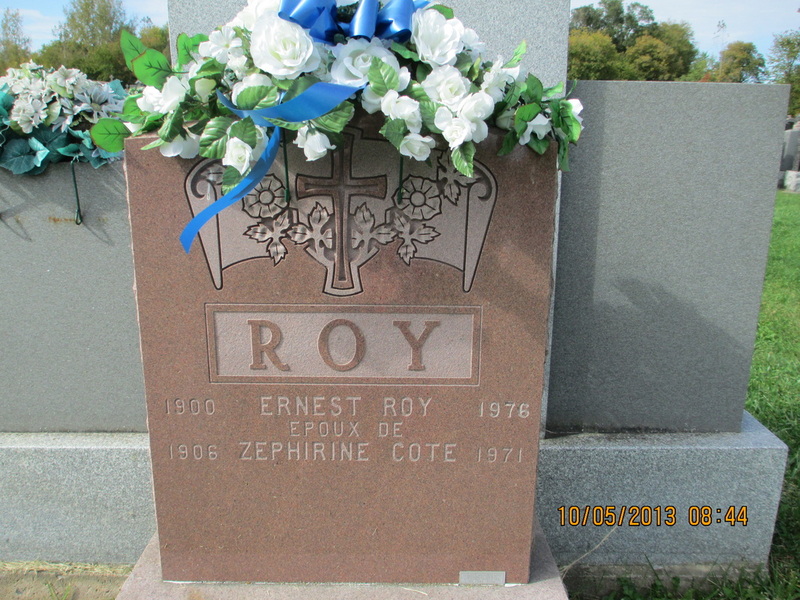 Ernest Roy (1900-1976) m. Zephirine Cote (1906 - 1971). 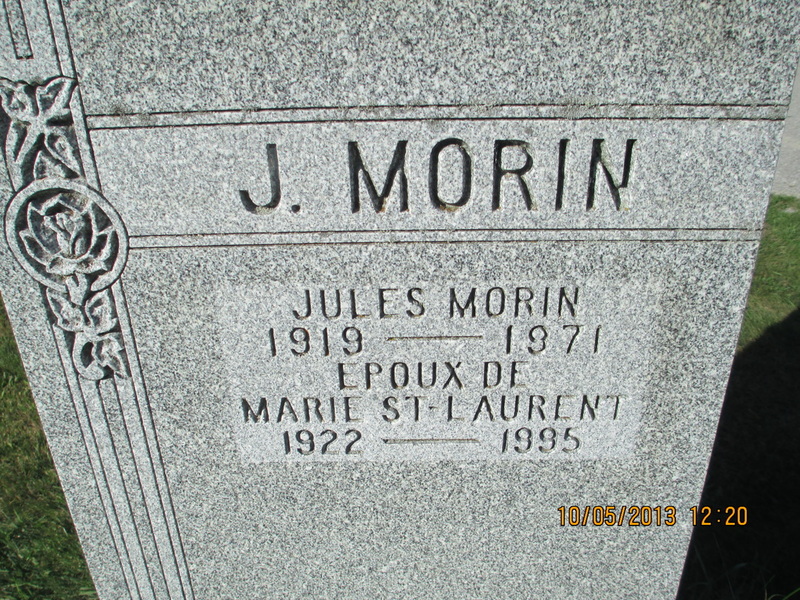 J. Albert Morin 1909-1965 spouse of Lucille Larocque 1915-1969. 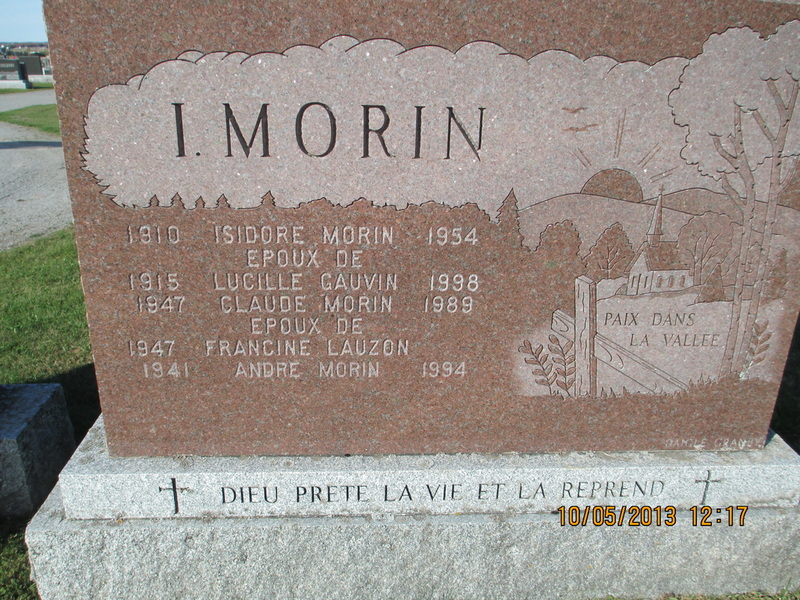 Jean-Francois Morin 1977-1994. 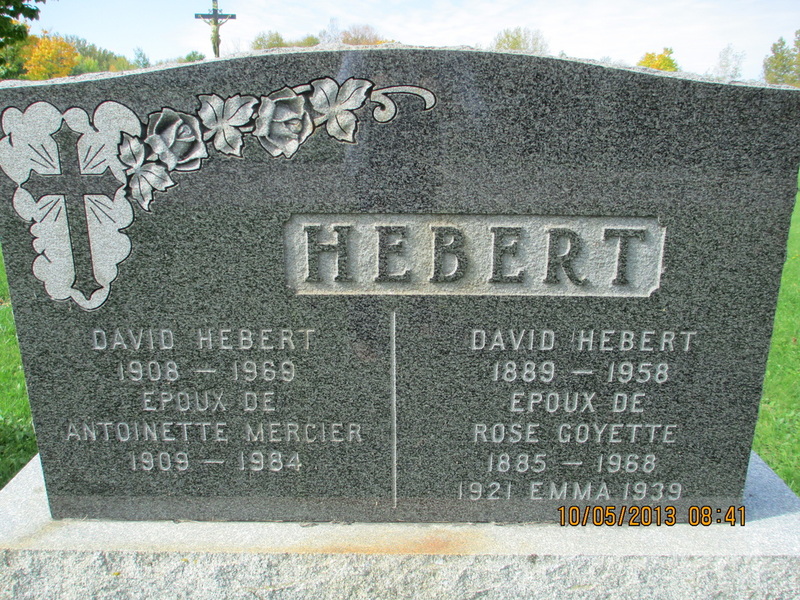 David Hebert 1908-1969 spouse of Antoinette Mercier 1908-1984. David Hebert 1889-1958 souse of Rose Goyette 1885-1968. Emma Hebert 1921-1939. 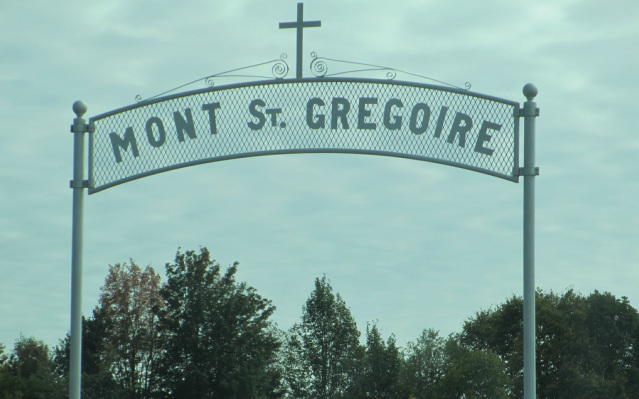 A few miles further down the road is the cemetery of Mont St. Gregoire. 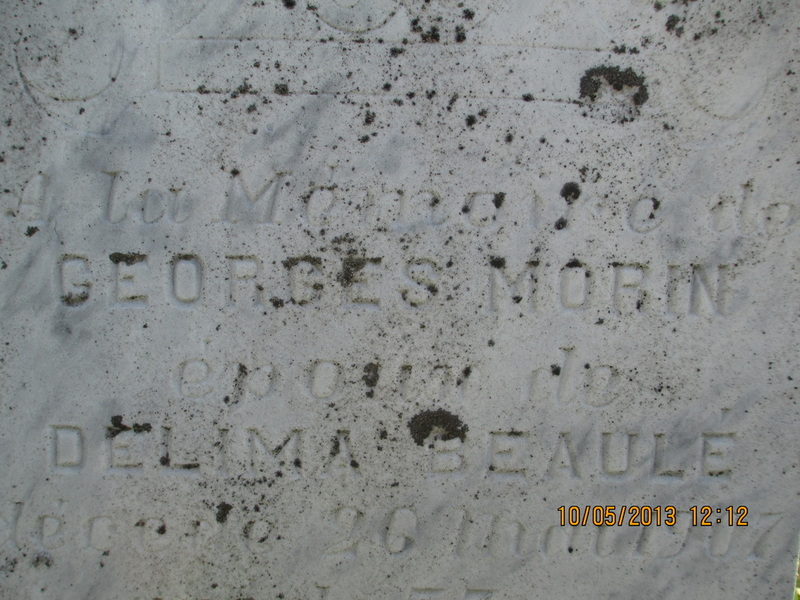 I did not see family names,however there were many Benoit and Normandin markers. This village was named for Gregory the Great, pope from 590 to 604. Saint André Bessette was born in Mont-Saint-Grégoire. 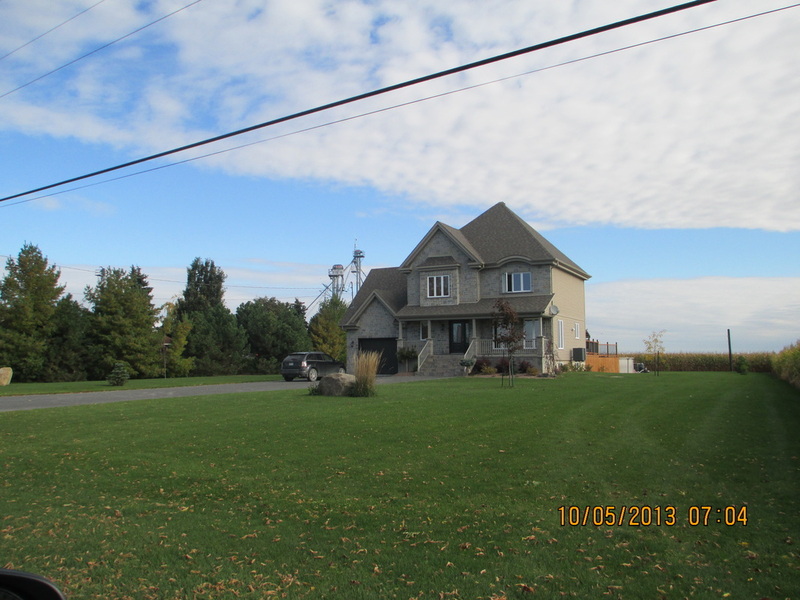 This is a municipality located in the Regional County Municipality (RCM) of Le Haut-Richelieu. The population is around 3,000. 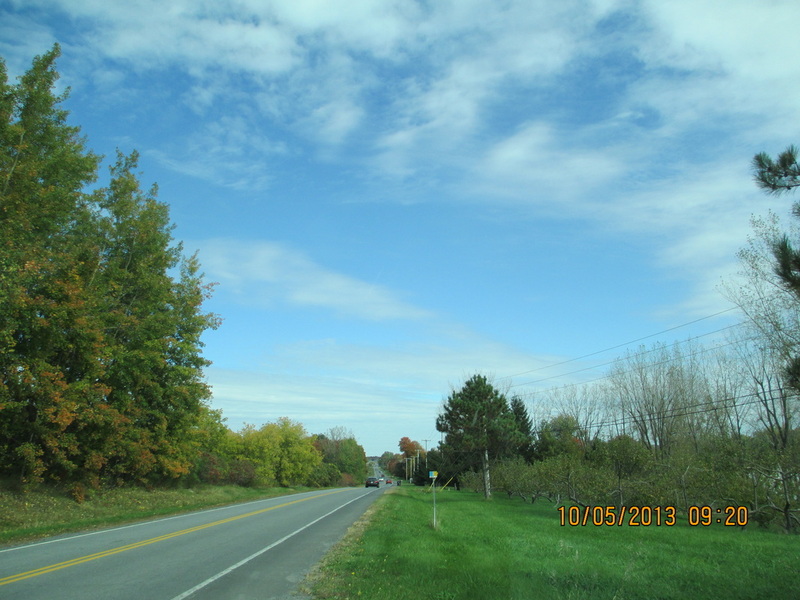 I give up the idea of continuing southeast toward Magog on to the Benedictine Monastery on the lake. By now it's already nearly noon. Our time is limited. We head north. I see a photo opportunity. Actually there is a photo op around every curve in the road. 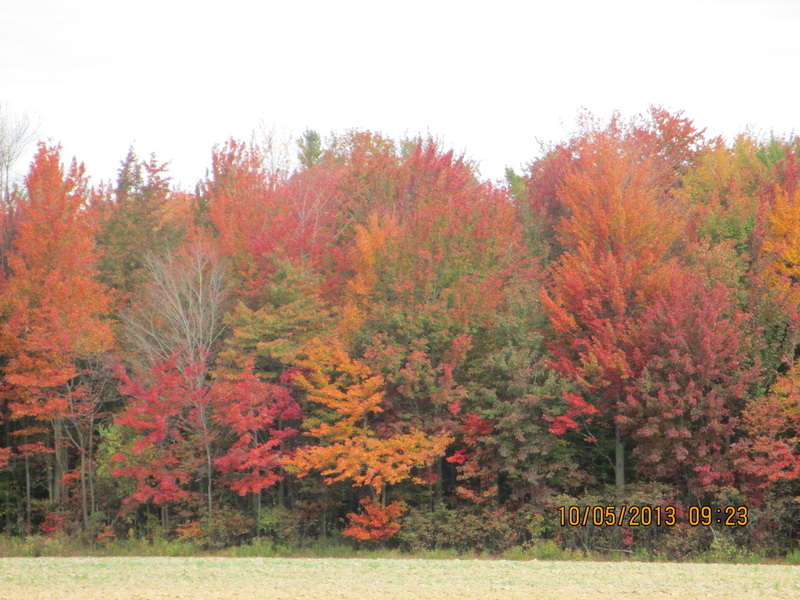 The trees are gorgeous even though many are past the peak. 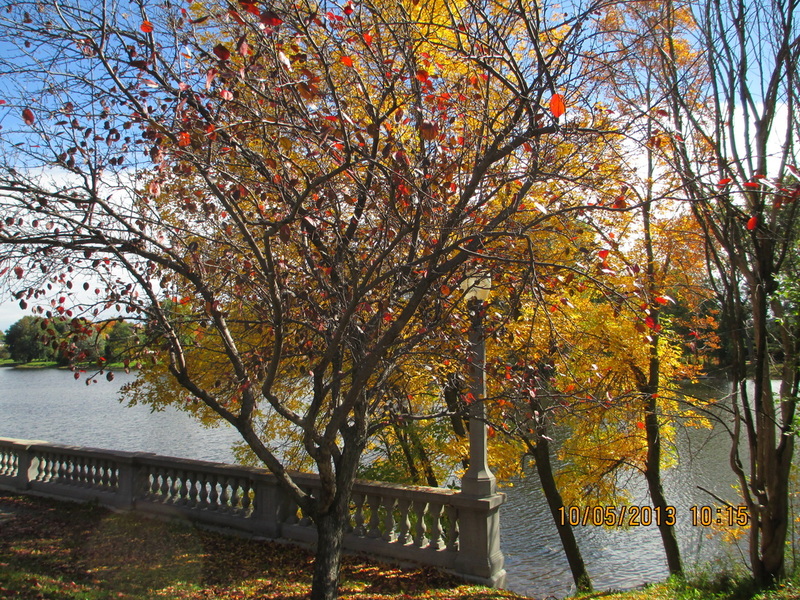 This area is noted for the maple trees. 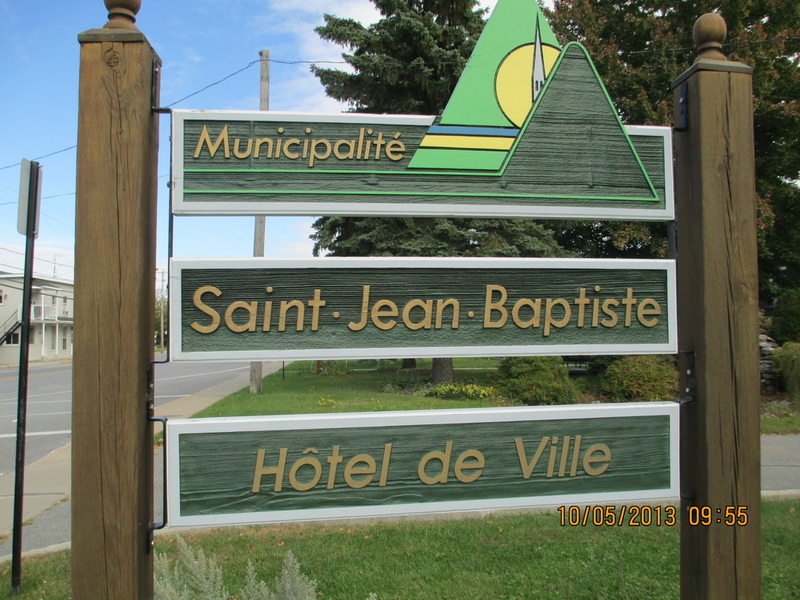 I'm beginning to see towns and villages of familiar family names; St. Jean Baptiste (two great-grandfathers), St. Alphonse (maternal uncle). St. Omer (paternal uncle). Levis (maternal uncle.) 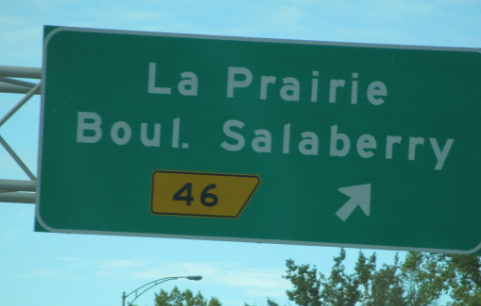 Many saint names are prevalent as we traverse the province of Quebec. Saints Michel, Madeleine, Sabine, Dominique, Cecile, etc. St. Amable. The street that I live on at home. This is country with a Catholic heritage. The former Mayor's Gateway, at St. Hyacinthe - erected 1927. The city located on the Yamaska River is about 30 miles east of Montreal. 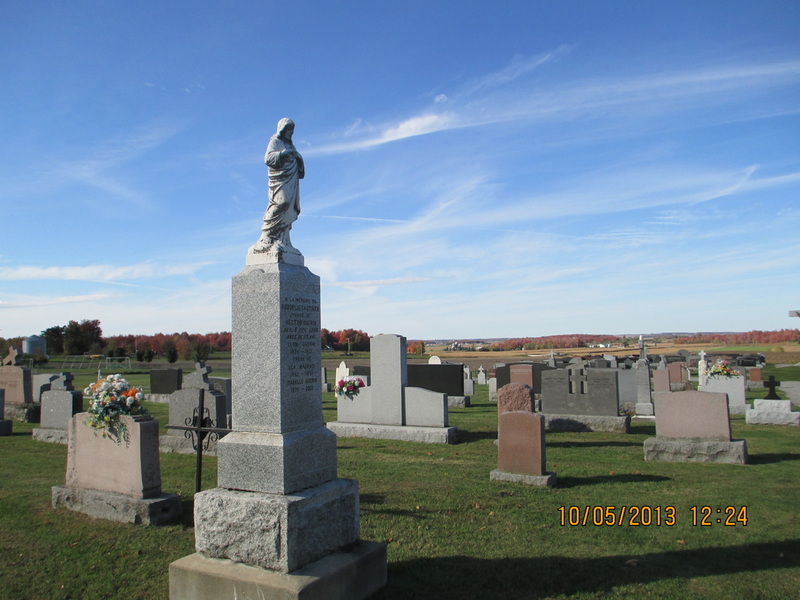 We stop and ask directions to the convent cemetery and learn it had been relocated after the convent was torn down. 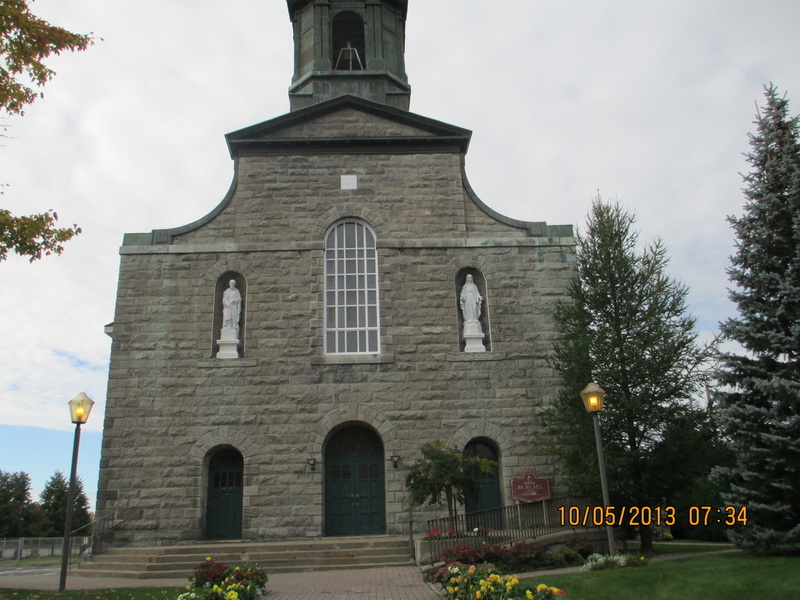 At St. Hyacinthe great-aunt, Sister Emmanuel (Angele) Morin made religious vows in 1887 in the Orders of Sisters of the Presentation of Mary. (B. September 22, 1866 -D. ?) 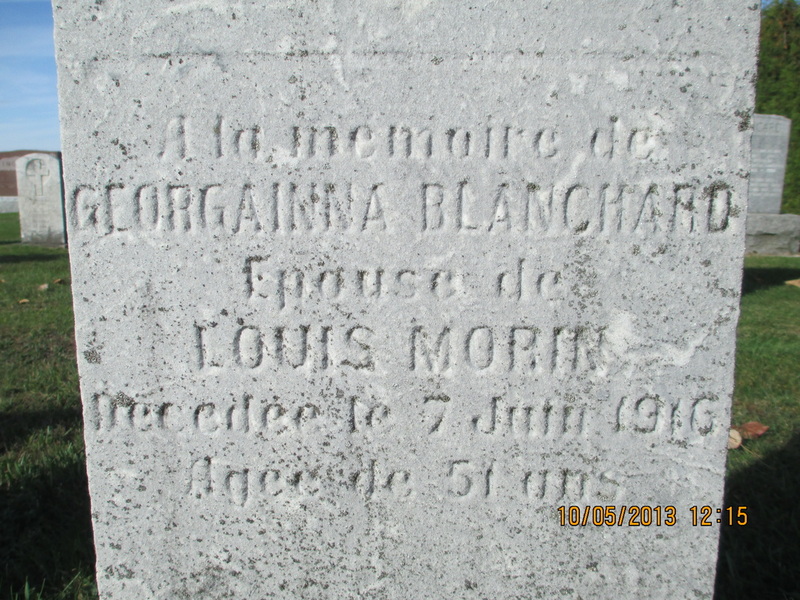 She was a sister to my grandfather, Stanislaus Morin. The convent is now gone and condos were built on the grounds. The convent cemetery was relocated and we tracked down one that held tombstones of soeurs (sisters) and peres (priests) but without a locator map of the sacred grounds I could not find my great-aunt's name but did find a few others. At. 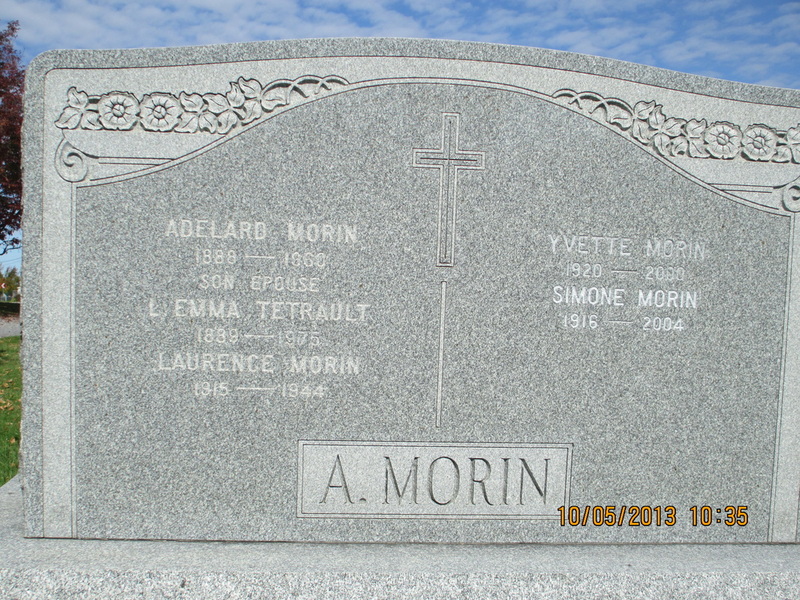 St. Hyachinte: Adelard L Morin 1888-1966. 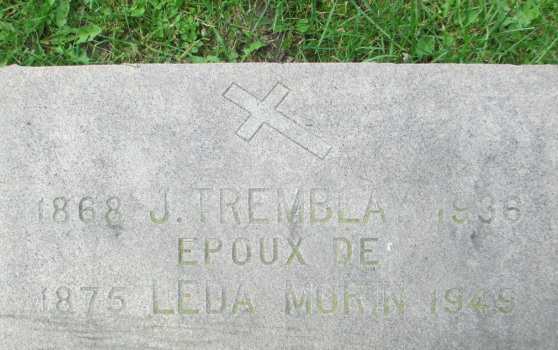 Married to Emma Tetrault 1889-1975. 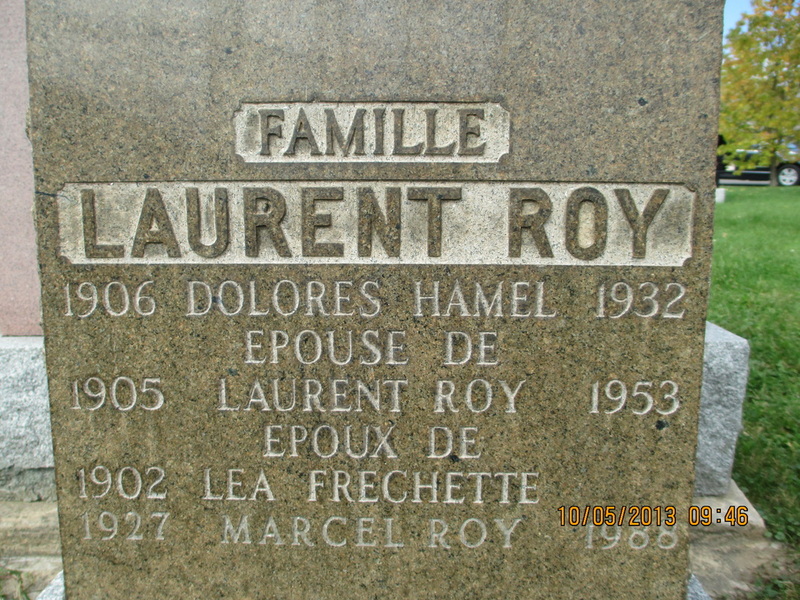 At St. Hyacinthe: Rolland Roy (1923 - 2002). Rhea Lalime (1923 - 1998). 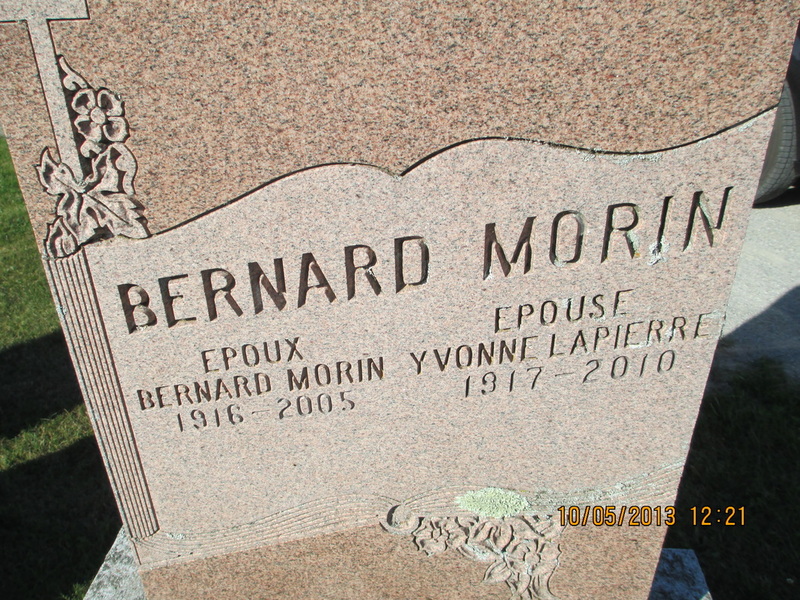 My great grand-father, Jean Baptist Morin (1822-1883) was born at St. Theodore D'Acton. 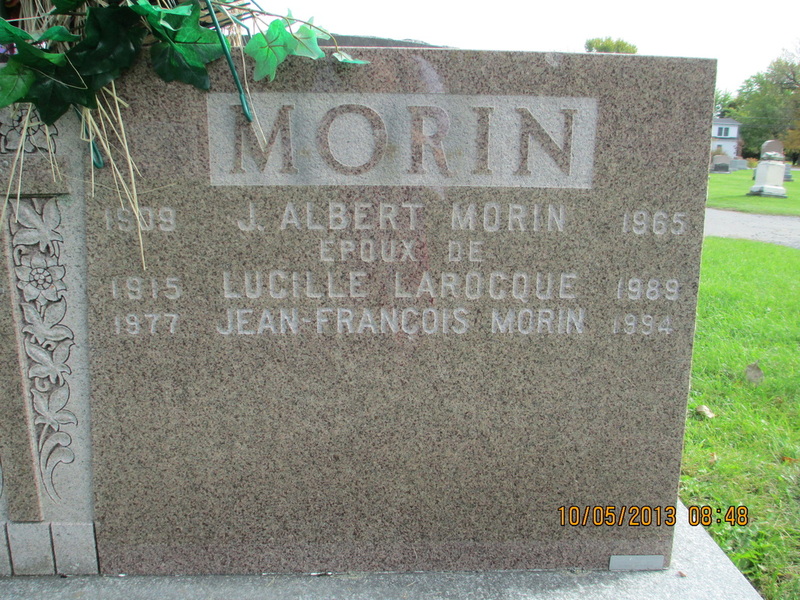 Married Olive Morin Morin (b. 1828-1906 with church dispensation. 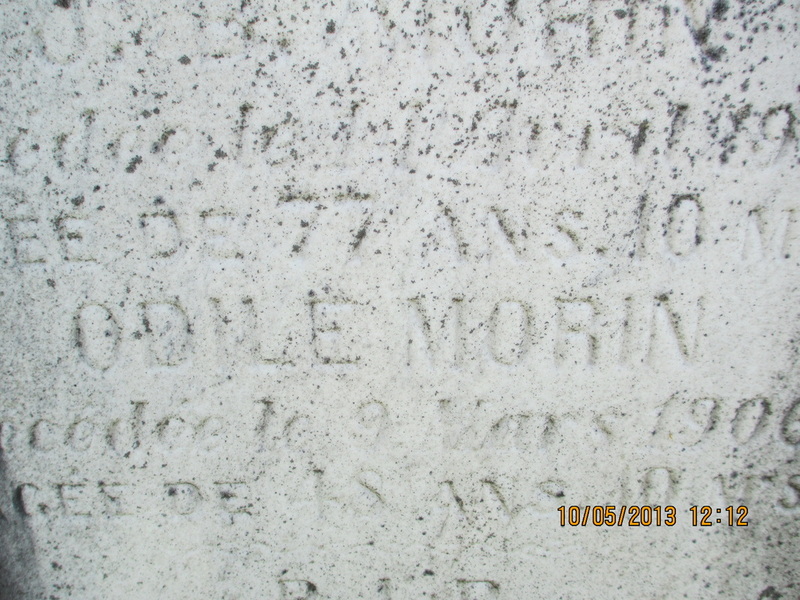 Stanislas Morin (my grandfather) was born 1862 at St. Theodore D'Acton. In 1880. at age 18, he immigrated to Kankakee, Illinois, then to Kansas following the enactment of the Homestead Act. Died 1929 Damar, Kansas. Married Rosanna Hebert at Damar, Kansas. She preceded him in death during childbirth in 1917 - unfortunately a much too common occurrence during those times. Typically the widower would remarry shortly after however, my grandfather Morin did not. Connecting with my ancestors. 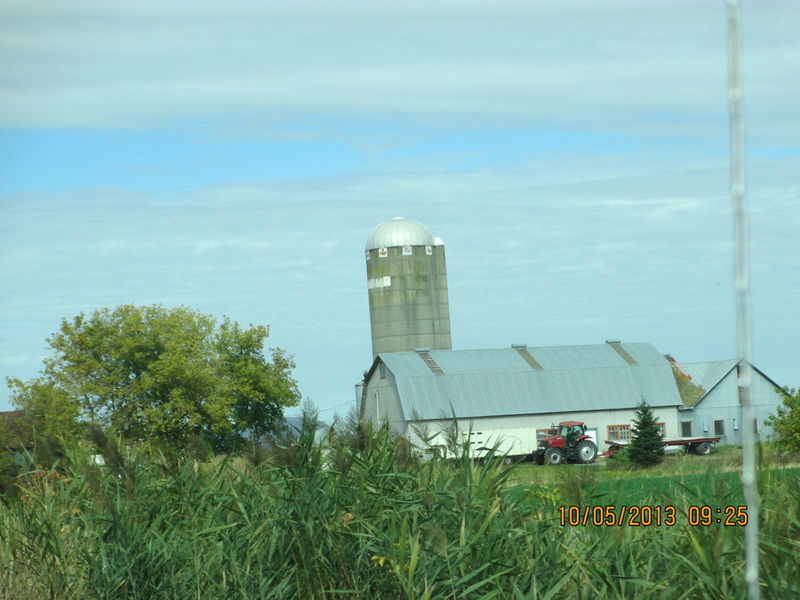 This land is still rural and agricultural. Seeing another sign makes it real. 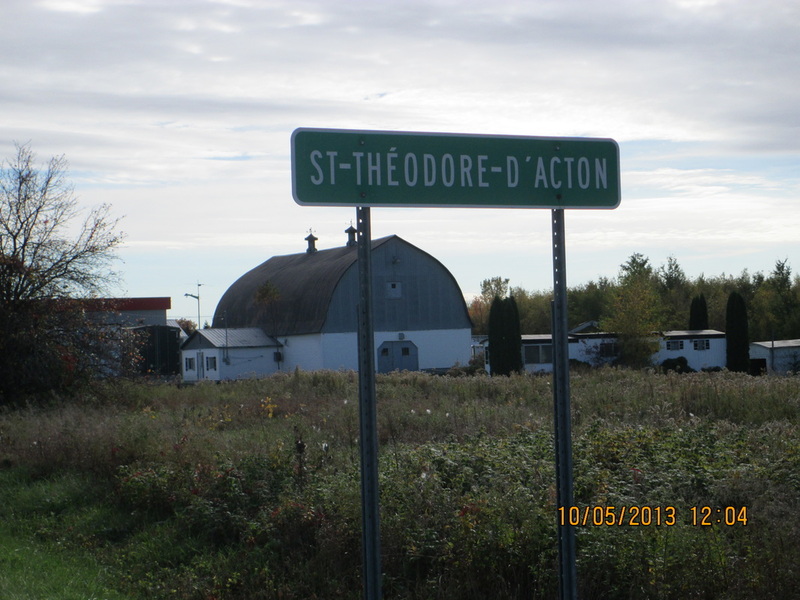 I was thrilled to see yet another sign to St. Theodore D'Acton. The village is so small it is not on the map. We hit a detour and had to go miles out of our way to find another entrance to the village. 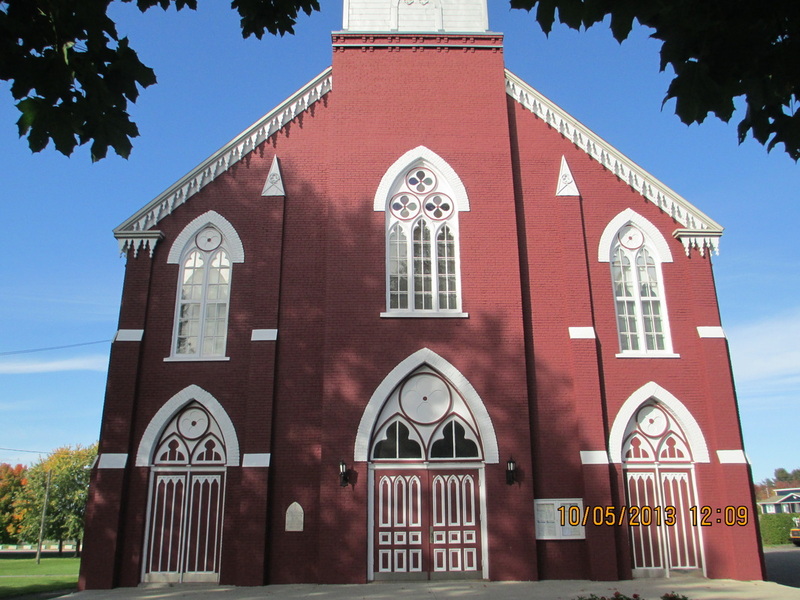 More then likely my grandfather attended this church (built 1866) before he immigrated to the U.S. in 1888. Possibly the church of his baptism and confirmation. Here in the flat, rural plains this cemetery near the sign to St. Theodre D'Acton seemed similiar to the one of Damar, Kansas. Cattle grazing just outside the fence of the cemetery. If asking for directions Rang means a county, or unpaved road. 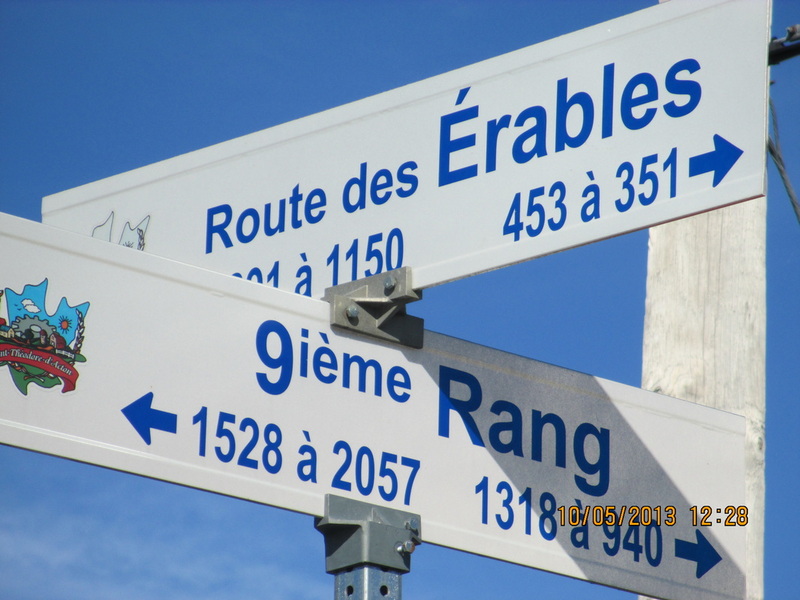 Erables means maple, or maple trees. 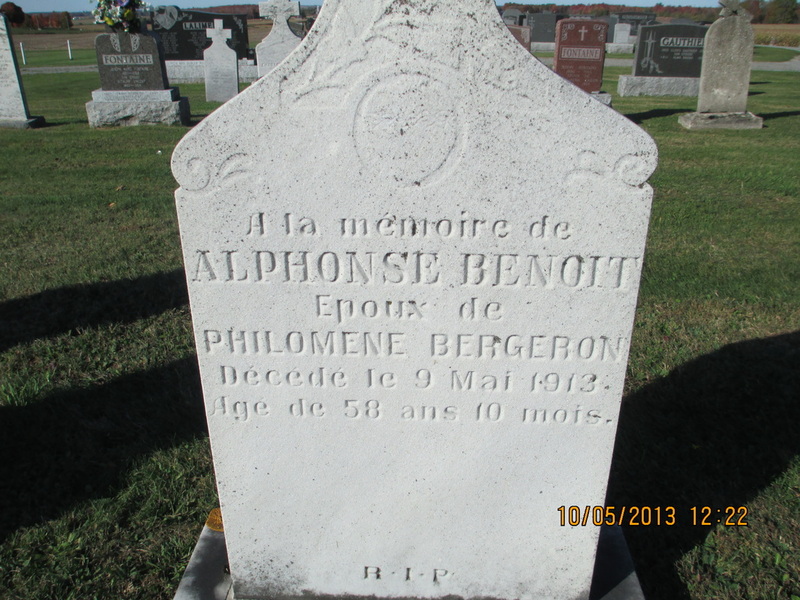 Alphonse Benoit d. 1913 m. Philomene Bergeron. 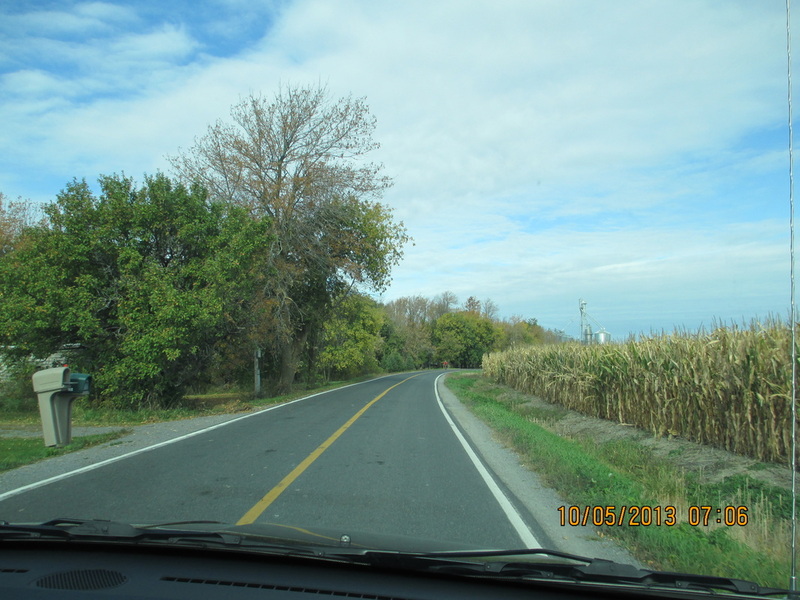 A county road #116 takes us on a wild goose chase. We dead end heading toward St. Theodore/Acton Vale with construction. Taking a U-turn we approach from another angle. The terrain is beginning a pattern that feels like Kansas. The area around Rooks County to be precise. My immigrant ancestors moved to an area that felt similar and comfortable to them. Flat land. Wide open spaces. 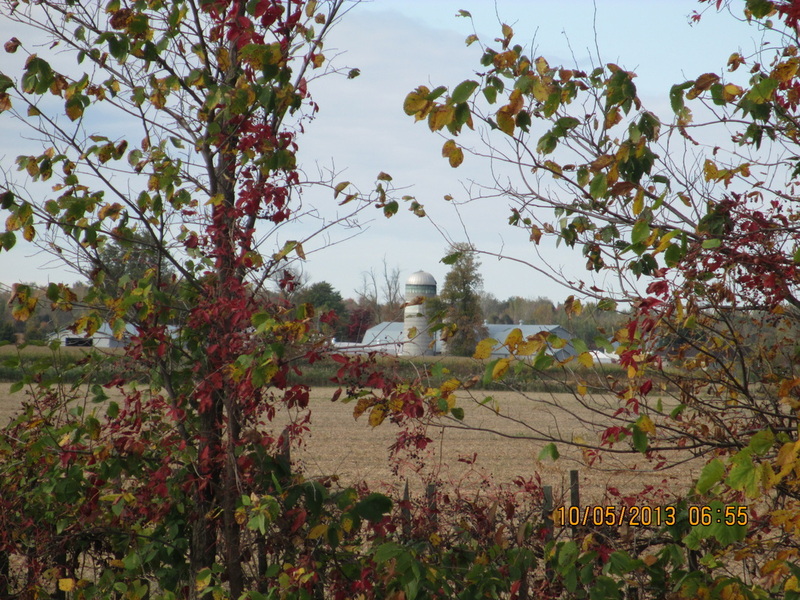 Farm land. Silos. It was uncannily similar. This is where my paternal grandfather, Philisime (P.H. Roy) was born. 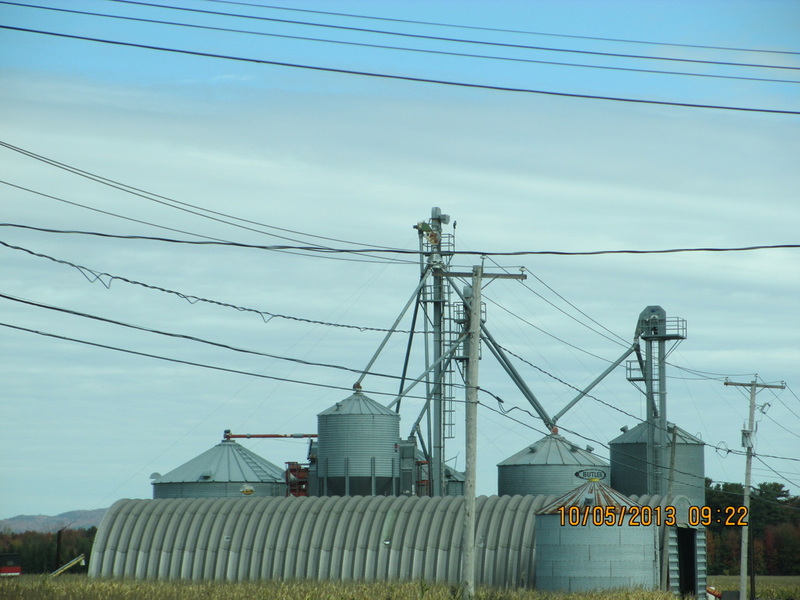 He immigrated from here to Rooks County, Kansas. Heading toward the city of Drummondville the terrain remains the same. Continuing northeast toward Quebec two beautiful bridges spanning the St. Lawrence River greet us upon entering the city. 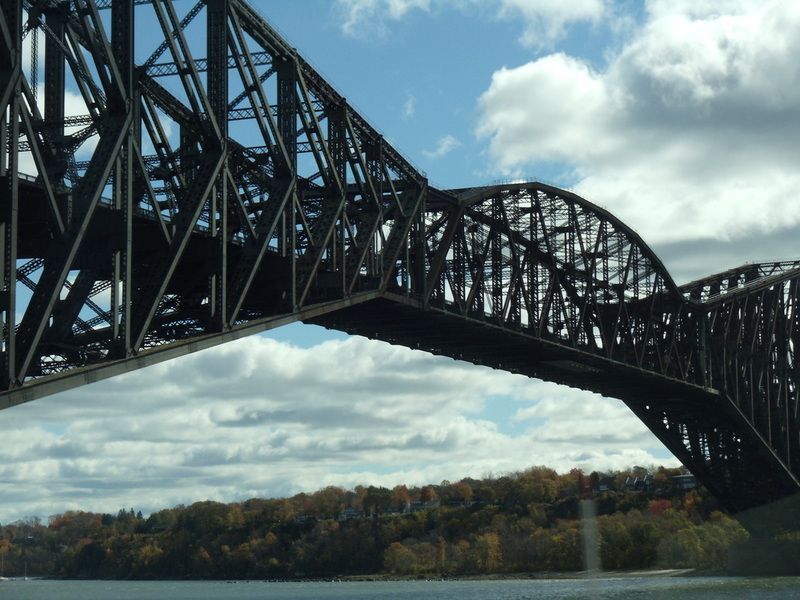 One of two beautiful bridges across the St. Lawrence River - Pont de Quebec. 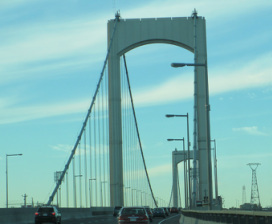 Pierre Laporte Bridge across the St. Lawrence River. After leaving Montreal this morning, spending the day in traffic, driving in circles through the countryside, and checking into our hotel we head to the heart of the dining district and have a light supper at The Cosmos, a hip restaurant. Randy and Lin in Old Town Quebec.